Diabetes: Are high blood glucose levels an effect rather than the cause of the disease? Insulin resistance and elevated blood glucose levels are considered to be the cause of type 2 diabetes. However, scientists from the German Cancer Research Center (DKFZ) and Heidelberg University Hospital have now provided evidence that things might be completely different. They showed in flies that elevated levels of the metabolite MG (methylglyoxal) cause the typical diabetic disturbances of the metabolism and lead to insulin resistance, obesity and elevated blood sugar levels. Flies are an established model to study energy metabolism. The body fat of this fly is labelled with GFP ("green fluorescent protein"). Type 2 diabetes, a form of diabetes with a typical onset in middle or older age, causes severe health complications including elevated risks for heart disease and strokes, massive blood flow problems in the legs as well as severe damage to eyes, nerves and kidneys. These dangerous late effects are believed to be caused by high blood sugar levels, which develop when the body cells no longer respond to insulin, the regulatory hormone that lowers blood sugar. Blood glucose levels correlate with the level of diabetic symptoms. When very high blood glucose levels are lowered using drugs, the rate of infarctions and strokes as well as blood flow problems decrease in parallel. "But this holds true only up to a certain point," said Peter Nawroth, Medical Director of the Department of Endocrinology and Metabolism at Heidelberg University Hospital. "Large clinical trials in recent years have shown: Even when blood sugar could be lowered by drugs below the diabetes threshold value, many patients nevertheless developed typical diabetic damage to nerves and kidneys. This suggests that type 2 diabetes might in fact have molecular causes that are independent of insulin and glucose." Peter Nawroth and Aurelio Teleman, who leads the Division of Signal Transduction in Cancer and Metabolism at the German Cancer Research Center (DKFZ) in Heidelberg, knew that in type 2 diabetics, high levels of a glucose metabolite called methylglyoxal (MG) have been observed. Medics have thought so far that this is an effect of elevated blood glucose levels. Since MG can cause damage to proteins, textbook knowledge consequently holds that it must be one of the culprits in causing typical diabetic damage. However, in light of their recent results, metabolism experts Teleman and Nawroth have now doubted this sequence of events. When rats are given MG with their food, they develop many typical signs of diabetes, including insulin resistance. The Heidelberg researchers planned to investigate the effects of long-term elevated MG concentrations on the organism. They chose fruit flies as a model for this purpose. "Flies and humans are not very closely related. However, since energy metabolism developed very early on in evolution, results are nevertheless meaningful and can usually be translated to mammals and humans." Using genetic engineering, the researchers turned off the enzyme that breaks down MG in flies. The glucose metabolite MG subsequently accumulated in their bodies. The flies soon developed insulin resistance. Later, they became obese and at higher age their glucose levels also became disrupted. "It appears to be sufficient to increase the MG level to trigger insulin resistance and typical diabetic metabolic disturbances," Teleman resumes. "This is clear evidence that MG is not the consequence but rather the cause of type 2 diabetes." This observation, in turn, raises the question about what might cause an elevated MG level. For example, obese people who are not diabetic also display elevated MG levels. "Why this is so, we don't know. This is an important aspect of our future research," said Nawroth. Teleman adds: "Production as well as decomposition of MG is influenced by numerous metabolic processes which we do not know yet and have to understand better. And we also urgently plan to study in mice which clinical symptoms long-term elevated MG levels cause in mammals." *A measurement for blood glucose level is the level of HbA1c. This is the percentage of the blood pigment hemoglobin that is bound to glucose. The normal range of HbA1c in healthy people is less than 6%. Picture caption: Flies are an established model to study energy metabolism. 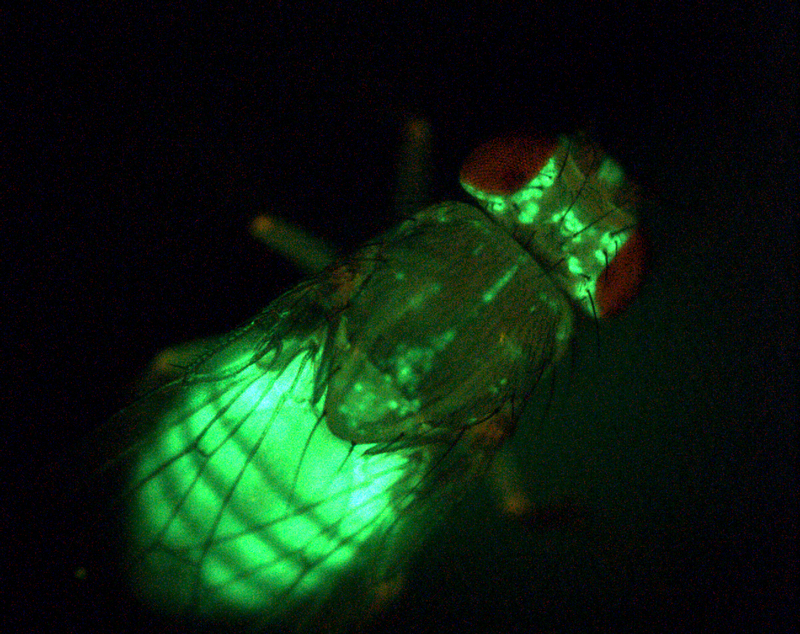 The body fat of this fly is labelled with GFP ("green fluorescent protein"). Use is free of charge. The German Cancer Research Center (Deutsches Krebsforschungszentrum, DKFZ) permits one-time use in the context of reporting about the topic covered in the press release. Images have to be cited as follows: "Teleman/DKFZ". Distribution of images to third parties is not permitted unless prior consent has been obtained from DKFZ's Press Office (phone: ++49-(0)6221 42 2854, E-mail: presse@dkfz.de). Any commercial use is prohibited. The German Cancer Research Center (Deutsches Krebsforschungszentrum, DKFZ) with its more than 3,000 employees is the largest biomedical research institute in Germany. At DKFZ, more than 1,000 scientists investigate how cancer develops, identify cancer risk factors and endeavor to find new strategies to prevent people from getting cancer. They develop novel approaches to make tumor diagnosis more precise and treatment of cancer patients more successful. The staff of the Cancer Information Service (KID) offers information about the widespread disease of cancer for patients, their families, and the general public. Jointly with Heidelberg University Hospital, DKFZ has established the National Center for Tumor Diseases (NCT) Heidelberg, where promising approaches from cancer research are translated into the clinic. In the German Consortium for Translational Cancer Research (DKTK), one of six German Centers for Health Research, DKFZ maintains translational centers at seven university partnering sites. Combining excellent university hospitals with high-profile research at a Helmholtz Center is an important contribution to improving the chances of cancer patients. DKFZ is a member of the Helmholtz Association of National Research Centers, with ninety percent of its funding coming from the German Federal Ministry of Education and Research and the remaining ten percent from the State of Baden-Württemberg.